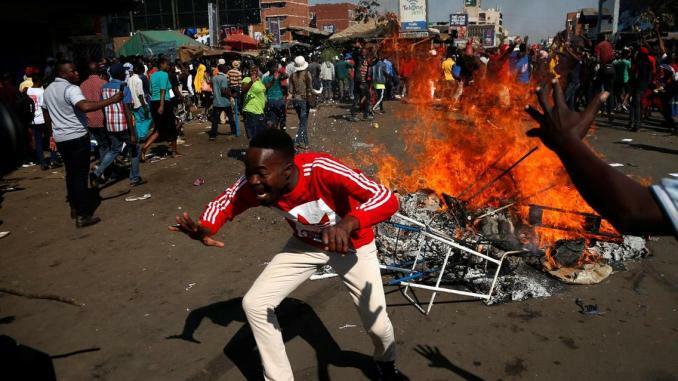 Four people were left wounded after security forces in Zimbabwe opened fire on a group of rioters that barricaded the main roads into on of the country’s major cities during protests sparked by a 150 percent rise in fuel prices. After announcing the hike in fuel prices on Saturday, Zimbabwean president Emmerson Mnangagwa boarded an aircraft amidst the riots on Monday for an official visit to different countries in Eastern Europe as well as Russia where he hopes to solicit investors and strike deals in a bid to help Zimbabwe’s failing economy. Rioting commuter bus drivers and activists blocked thoroughfares with burning tyres, tree branches, and stone blocks in the southern city of Bulawayo. Riot police tried to quell demonstrations in the western suburbs of Emakhandeni and Luveve, but despite wounding four people while firing warning shots and tear gas, protesters remained defiant. The Zimbabwean military was subsequently deployed to assist police after the government vowed that it “will not hesitate to take action” against protesters who threaten to destabilise the country. The government announced an increase of more than a 150 percent in fuel prices for N$19 per litre to a whopping N$45 per litre for both petrol and diesel. The widespread protests started after certain workers’ unions called for a three-day nationwide shutdown. Since the crash of the hyper inflated Zimbabwe dollar in 2008, the country uses several currencies including the US dollar and its unpopular local surrogate called the “bond note”. Because of a severe shortage of foreign exchange, most daily transactions are done in bond notes with the US dollar and South African rand trading on the black market at inflated rates. Commuter fares have doubled due to the price rise since Saturday’s announcement while some businesses shut their doors to protect stocks from potential looters. In certain areas of the main cities police battled to stop looters from entering and destroying shops. In Bulawayo’s city centre, people marched to the court and disrupted proceedings. Crowds swelled as ordinary citizens joined with protesting activists to add their voices to the anti-fuel price demonstrations. In Epworth, a low income area outside the capital Harare, four people were reportedly shot by security officers while eight people were arrested. Reports from Harare also stated that police conducted house-to-house searches looking for protesters. Since the government’s introduction of a two percent transaction tax in October, Zimbabwe’s foreign exchange woes have worsened and inflation has soared to double-digit figures. 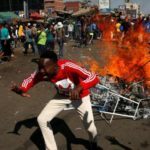 The government of Zimbabwe issued a statement condemning the riots as Western-sponsored acts. “This brazenly unconstitutional plan which has sought financial support from some regime change organisations based in America and Germany, among other countries, represents a serious threat to our consolidating democracy, to the rule of law in our country, and to the authority of government and the state,” the statement said.